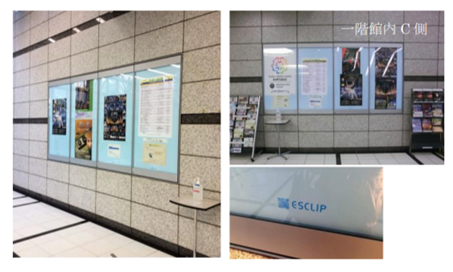 ESCLIP is already in an emblematic building in Japan, The International Conference Room in Osaka (Grand Cube Osaka) One of the many emblematic buildings in Japan presented 23 ESCLIP notice boards in front of the main street and in the corridor of the same building. We interviewed Mr. Okuno of the Planning Department Division and Dr. Shinichi Kogane of the Facilities Management Division and Sales Division to get their opinion on ESCLIP. P1: What was the reason for adding ESCLIP to your installation? Sr. Okuno: We wanted to improve the first floor flow line in our new project to improve the company, at that time we were looking for new ideas. After seeing several options we decided to adopt ESCLIP and place it in the international conference room nationwide. 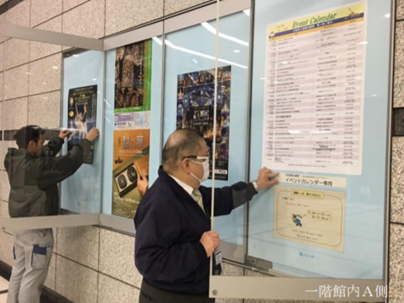 El Sr. Kogane: Until now I only saw bulletin boards and magnet-type bulletin boards. I was looking for a variety of things to make the area into something with a high degree of design even in the situation. I got information about ESCLIP in the Creative Technology exhibition stand and I found it very interesting from that moment. P2: What are the features that most value of ESCLIP? El Sr. Okuno: One of the things I like the most is that it looks overwhelmingly beautiful. The previous type of bulletin board fixation that we used in the building facilities caused the paper to deteriorate. However, ESCLIP adheres the papers perfectly. El Sr. Furukin: I’m impressed with the product! It is an organized and clean adhered paper method. El Sr. Okuno: Since we have ESCLIP we do not have to worry about the fall or oxidation of metal pins. We consider that using only batteries is an economical way and offers the confidence that other types of products that connect to the electricity grid can not provide. P4: How about the design? 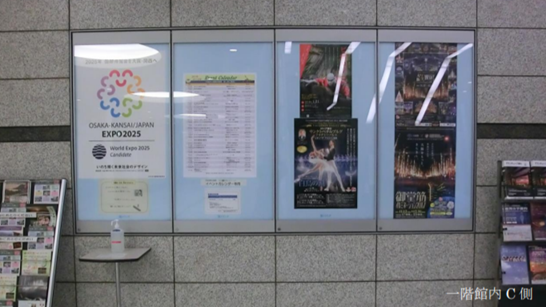 El Sr. Okuno: The previous bulletin board was a light gray color, but this time we opted for a conceptual blue color. As the building itself is gray, the color is beautiful and it has an impact on the clients, making the items that are on display more striking. I was surprised to hear that ESCLIP can be customized however you want. When I can print my favorite image so that it is part of the background of the board. This time I made the image of the company blue, but I adopted a thin grid pattern to straighten the poster directly and even if it misaligned slightly I can fix it many times and it will not damage the poster.